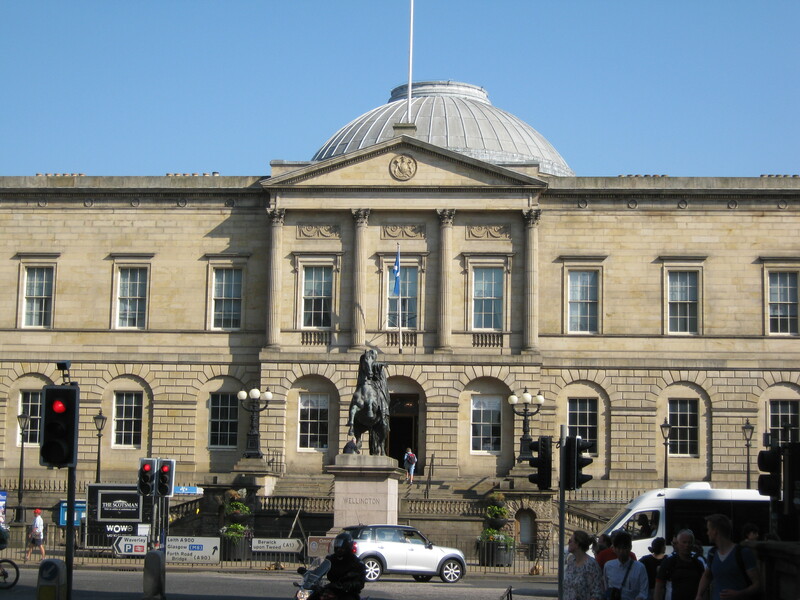 I began the day by going to obtain a readers ticket for the National Records of Scotland Historical Search Room. I arrived at the General Register House just before their doors opened at 9am. The registration process was quick and easy (as I had come fully prepared). So I was done and out again in just 20 minutes. General Register House, from North Bridge, Edinburgh. My plan is to return to the Historical Search Room later during my week in Edinburgh, to see some records I’ve identified from the National Records of Scotland catalogue, that look to be of interest to me. Some of these records are listed as being “off site” and need to be ordered in advance. So before leaving I made my request for those documents, so that they will be available to view on the day that I plan to go back there. I then headed to a bus stop and caught a bus out to explore a bit of West Lothian. My first stop was Kirkliston where I had arranged to meet Joe Henderson, who was able to open the church building for me to see inside. I have visited the Kirkliston churchyard a couple of times before, but not previously seen inside the church. Joe appears to know a great deal about the history of Kirkliston church and the parish. He gave me a copy of “Kirkliston; A Parish History” by Donald Whyte, and I gave him a copy of the history I have about my WALKER family. After a little while inside the church, we went out into the churchyard, where I went particularly to look at the WALKER family gravestones there, and to take some new photos of them. Unfortunately (as you will see from the photo – below) a bush has been allowed to grow up right in front of the oldest gravestone – that of “William WALKER, late tenant in Hiddlefold, who died on Jan.1st 1768, aged 73″. But I was able to pull the branches away enough to check the inscription, which is still readable. 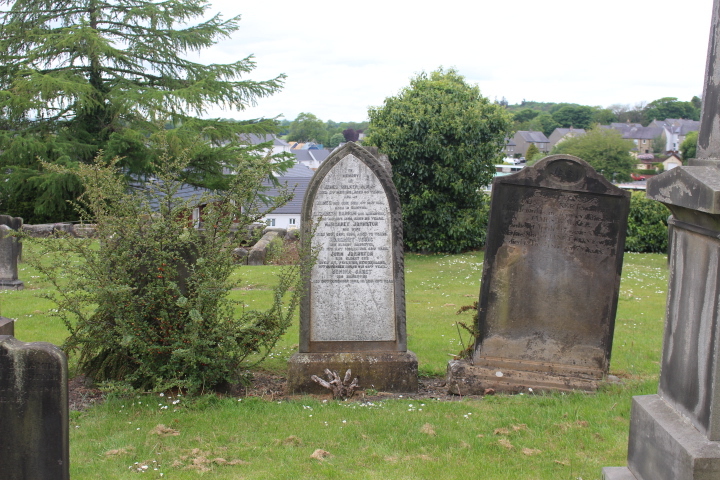 3 Walker family gravestones in Kirkliston churchyard; the oldest (on left) of William Walker, d. 1/1/1768, aged 73; on right, William’s son and daughter-in-law, James Walker & Janet Flint, and centre, James & Janet’s grandson, also James, his wife, Margaret Johnston, and several of their children. Joe was then able to give me a lift to Kilpunt. I had a good look around there, taking a number of photos, and wandered down to the nearby site of Hiddlefaulds, where the Walker family had farmed from about 1745. 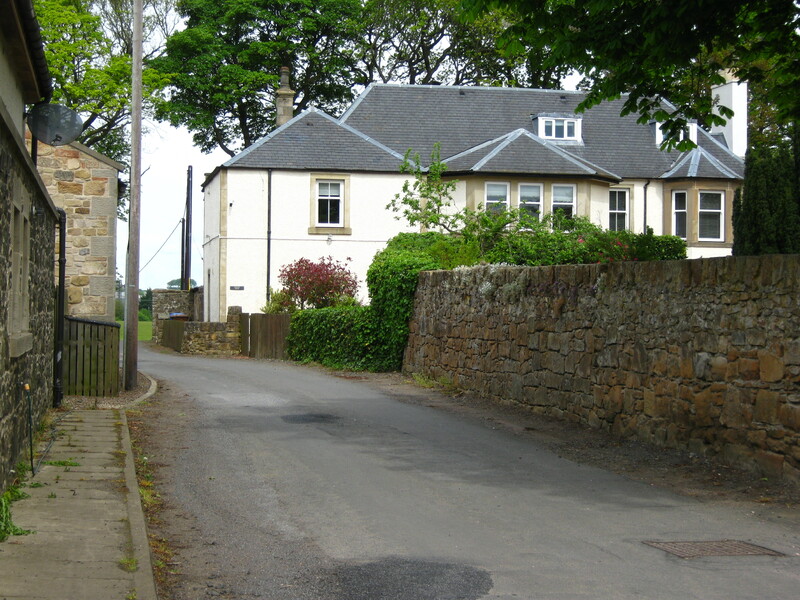 There is now just a pile of stones on the site of Hiddlefaulds (which I believe was demolished in the 1890’s), and all the farm buildings at Kilpunt have been converted into houses. From Kilpunt I went on to Broxburn, then Livingston. In the afternoon, on route back to Edinburgh, I got off the bus in Kirknewton, where the Walker family also farmed, to have a look at the old graveyard there. I didn’t really expect to find any Walker gravestone inscriptions there, but thought I’d have a good look anyway! So I looked, but didn’t find anything of family interest there! A couple of weeks ago I began to have a fresh look for what I could find out about my JOHNSTON ancestors, from Bathgate in West Lothian, in the WALKER branch of my family tree. Now I want to write up about the new things I’ve found. In “Part 1”, I’ve posted a transcription of an amazing newspaper article, from the “Falkirk Herald”, on Saturday, 15th August 1925; page 11 – which I found a few days ago, via the British Newspaper Archive. The article is full of biographical information about two of my direct ancestors; Thomas JOHNSTON (my 4x Gt-Grandfather), and his father-in-law, Patrick MAIR (my 5x Gt-Grandfather). “Part 2” is my chance to say what set me off on this, and what I’ve found; to make some more comments about the newspaper article in “Part 1”, and mention some other things that I’ve found. I begin in September 2016, when I was contacted through AFamilyHistoryBlog by “Nevada Bob” who had been photographing gravestones in Bathgate, for the website FindAGrave.com. Bob asked me if a particular grave was of interest to me in my family history research. That grave wasn’t! But Bob suggested that I keep an eye on the Find A Grave website for anything of interest, as he added more of his photos. A couple of weeks ago I had another look on the Find A Grave website and saw a photo and transcription, which Bob had added, that very clearly is of interest to me – see HERE. So I got back in touch with Bob, via e-mail, about it. This is the gravestone of John JOHNSTON, his wife – Margaret YOUNG, and 3 of their children. There was some brief (and understandable) confusion, with Bob mistaking a photo that I’ve posted of Margaret JOHNSTON, to be of her mother – Margaret YOUNG, who is named on the tombstone. But that was soon clarified. Due to this, I was spurred into doing some fresh internet searches looking for anything new that I could find about the Johnston family. I started looking for gravestone records, comparing 2 websites; Find A Grave.com, and BillionGraves.com (which I’ve been using recently, and rather like). The two sites were quite similar, and I found nothing particularly new on either one. You might find that a grave is on one website, but not on another, or has been transcribed slightly differently, or that one site has a better photo than another! So its worth using the different sites. When searching for the JOHNSTONs had yielded very little new information, I looked back further, and began searching for John JOHNSTON’s maternal Grandfather “Patrick MAIR”, who was a printer and publisher in Falkirk, and his brother “Thomas MAIR”, a “merchant”/banker in Bathgate. I knew almost nothing about them beyond what little is on the old “Genealogical chart of the JOHNSTON family”, which I’ve previously posted about. I soon found two particular sources of information on-line, that gave me lots of new details about Patrick MAIR and his descendants. One is the Falkirk Community Trust, which operates the Falkirk Archives. They hold a collection of legal papers about Patrick, and Thomas MAIR, and some of Patrick’s descendants – mainly the RANKINEs, through one of Patrick’s daughters; Isabel(la). The Falkirk Archives’ description of the “Mair and Rankine family papers” says quite a lot about Patrick MAIR and his family, and the archives’ “finding aid (no.33)” (PDF file) also give a brief description of each document that the archive holds about the family. Both of these pieces are interesting to read through. The second source was some old newspaper articles from the “Falkirk Herald”, available through the British Newspaper Archive. The Falkirk Herald was the first newspaper to be owned by the Johnston Press; the printing business established by Patrick MAIR and Thomas JOHNSTON, and continued by some of Thomas’ descendants. I have found articles of interest, about Patrick MAIR, and Thomas JOHNSTON, printed on 3 different occasions in the Falkirk Herald. The earliest article is a relatively short biography of Patrick MAIR, printed on Wednesday 7th April 1909. I’m interested that this seems to be very close to the time when the “Genealogical chart of the JOHNSTON family”, that I have, was produced. Might this chart, or the chart’s author – Alexander Cuthbert, have informed the article? (No author is credited with the newspaper article!). Although one big discrepancy is that where the chart says that Patrick died in “1796”, the newspaper article states that he “retired from business in 1797”, and died “on 20th February, 1805”. I think that the newspaper article has more authority on this! This 1909 article says that “the works which came from the press of Patrick Mair were very numerous, and it is hoped that at some future time a list of these will be obtained for publication.” The next article that I’ve found lists some of these works. But I have not yet found any indication of a comprehensive list having been produced. Perhaps it’s never been done! But if anyone knows otherwise, I would be interested to hear. If so please leave a comment below, or use the Contact Page to get in touch. The second occasion where I’ve found an article is in an issue of the Falkirk Herald, marking the newspaper’s “eightieth anniversary”, on Saturday, 15th August 1925. It is the text of this article that I have posted in “Part 1”. It contains all the details from the 1909 article and more. This article then goes on to tell of Thomas JOHNSTON’s succession to Patrick’s printing and publishing business, and beyond, to tell of two of Thomas’ sons. The third occasion, marking the Falkirk Herald’s “ninetieth anniversary”, on Saturday, 10th August 1935, appears to be an almost exact repeat of the “eightieth anniversary” article. Being a “Real Christian” myself (to use the end of the title from the 1783 publication – the 1st known work from Patrick’s Falkirk Press), I was intrigued to discover in these articles the list of clearly “Christian” titles that Patrick published. I would like to find out more about some of these publications. It appears that there is quite a strong spiritual heritage, seeing just how many of Patrick’s descendants went into church ministry! I count 3 great-grandchildren – 2 named in the article, and 1 on my JOHNSTON Genealogical Chart. But Patrick’s son-in-law, Thomas JOHNSTON appears to have gone off-track – joining the non-Christian, Masonic Lodge! There are many sites which explain why, from a “Real Christian” perspective, Christianity and Freemasonry are incompatible; here are a couple of examples; www.EMFJ.org & www.Ephesians5-11.org. Also a Wikipedia article about the positions taken towards Freemasonry by various church denominations (and cults). I would be very interested to find out more about Thomas JOHNSTON’s “progenitors”; the DAVIE family. Is there a real connection to the Covenanter, James DAVIE? I suspect the problem in proving it may be a lack of Covenanter records (equivalent to the English non-conformists)! I know from the Genealogical Chart that Thomas JOHNSTON’s paternal grandmother was a Marion DAVIE. I have no dates for Marion, except for the birth of her children between 1723 and 1728. From that we could infer that Marion was born around 1700. James DAVIE was killed in 1673, which suggests to me that perhaps he was the same generation as Marion’s grandparents! If you know anything more about this DAVIE family, please leave a comment below, or use the Contact Page to get in touch. I’ve mentioned lots of generations of my family above, and I realise that it could be confusing! So I’ll finish with a couple of overlapping genealogy lists, which cover all those mentioned. Those mentioned above are in Bold text below. The number “0x” is the number of Great-grandparents back in my tree; so “3x” is my 3 times Great-grandparent(s). Or you can look at my WALKER tree page. 6x – Thomas JOHNSTON, m. Marion DAVIE. 5x – John JOHNSTON, b.1723, m. Margaret WEIR. 4x – Thomas JOHNSTON, b.1755, d.1831, m.1785, Margaret MAIR, b.1767, d.1838. 3x – John JOHNSTON, b.1786, d. 1872, m. Margaret YOUNG, d.1878. 2x – Margaret JOHNSTON, b.cir.1818, d.1890, m.1847, James WALKER, b.1818, d.1881. 5x – Patrick MAIR, b.1738, d.1805, m.1863, Jean AITKEN b.cir.1726 , d.1819. 4x – Margaret MAIR, b.1767, d.1838, m.1785, Thomas JOHNSTON, b.1755, d.1831.